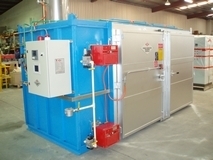 The clean pyrolysis burn-off process is free of hazardous emission. It is a non-chemical & toxic cleaning process for removing paint & plastic coating on metal parts to support a green, sustainable and healthy environment The Burn-Off furnaces comply with the strictest environmental guidelines for safe removal of coatings or pollutants from any metal parts. Motor Rewind Industry - stripping electric motor stators, armatures, transformers & field coils without damage to base metal. The cleaning process complies with the Motor Rewind Standards. Paint Jig Cleaning - removal of Paints, Epoxies, Powder Coatings without any mechanical damage or distortion to the products. Plastic Tooling - for pollution-free cleaning use heat to remove Plastics or Polymers from tools such as Spinnerettes, Screen Packs, Breaker Plates, Moulds, Dies, Pumps, Nozzles, Tips, Mixers and Extruder Screws, Etc. operates on either LP Gas, Natural Gas or light fuel oil.